Looking for an out of this world holiday gift opportunity or an incredible marriage proposal or anniversary idea? 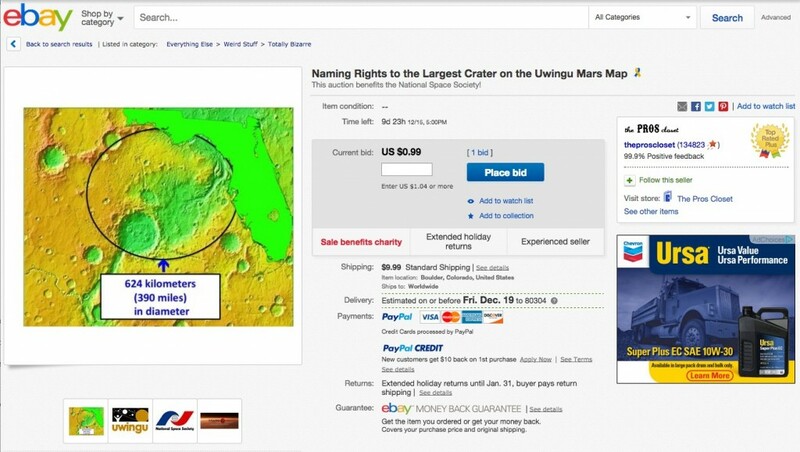 For the next 10 days, eBay and Uwingu have partnered to give anyone the opportunity to naming rights for the biggest unnamed crater on Uwingu’s Mars map—a first of its kind auction. With over 14,000 craters named on it by the public in 2014 alone—more than ten times the number named by scientists in the past 50 years, Uwingu Mars’s map is becoming a de facto standard as the most complete map of Martian craters. The huge, ancient crater, located at 25.1 deg south latitude and 327.3 deg east longitude on Mars is 627 km (391 miles) in diameter—as big as the state of Florida; it is bigger than 60% of the countries on Earth. The name given to the crater by the eBay auction winner will forever be recorded on our new map of Mars, and then sent to Mars by the Mars One project The winning winner will also receive a framed certificate of naming, two (2) VIP passes to the Mars Insight mission launch—NASA’s next Mars launch, and a handsome desk globe of Mars valued at over $300. Uwingu founder and CEO, Dr. Alan Stern is available for interviews about this auction immediately. Contact him HERE. ← Uwingu Announces Holiday Gifts—From Mars! How can you sell something you cannot own or claim?? NASA and the IAU dissociates itself entirely from the commercial practice of “selling” fictitious star names or “real estate” on other planets or moons in the Solar System. Accordingly, NASA and the IAU maintains no list of the (several competing) enterprises in this business in individual countries of the world. We think that there will be many maps of Mars in the future, just as there are many maps of the sky today.